This set of Molecular Biology online test focuses on “Manufacturing the Message – 2”. 1. How many nucleotides of the growing RNA chain remain base paired with the template DNA? Explanation: Only 8 or 9 nucleotides of the growing RNA chain remain base paired with the template DNA. The remainder of mRNA chain is peeled off and directed out of the enzyme through the RNA – exit channel. 2. The transcription bubble formed for facilitating RNA synthesis is about _____________ nucleotides long. Explanation: The transcription bubble formed for facilitating RNA synthesis is about 17 nucleotides long. This is the region of unwound DNA where the two strands are separated. The bubble seems to move along with the RNA polymerase as the RNA grows in length. 3. The nascent RNA forms a double helix with the non – coding strand. Explanation: The nascent RNA forms a double stranded hybrid helix with the antisense strand which is also known as the non-coding strand. The helix formed by the RNA and DNA is about 12 base pairs long. 4. How many proof-reading activities does RNA polymerase have? Explanation: The RNA polymerase has 2 proof-reading activities. They are pyrophospholytic editing and hydrolytic editing. 5. The RNA polymerase can remove only the incorrect bases from the nascent RNA. Explanation: The RNA polymerase is able to remove both correct and incorrect bases from the nascent RNA. As it spends longer hovering over the mismatched bases than the matched ones thus it removes the mismatched bases more frequently. 6. The Gre factor enhances the hydrolytic editing function of the polymerase. Explanation: The hydrolytic editing is enhanced by the Gre factor and also serves as the elongation stimulating factor. That is, they ensure that the polymerase elongates efficiently and helps overcome “arrest” at sequences that are difficult to transcribe. 7. E. coli polymerase adds upto _____________ nucleotides per second. Explanation: The E. coli polymerase adds upto an average of 40 nucleotides per second. This rate varies depending upon the local DNA sequence. Explanation: The Gre factor is homologous to the eukaryotic factor TFIIS. The TFIIS factor stimulates the RNA polymerase II during transcription in eukaryotes by increasing its efficiency and proof-reading activity. 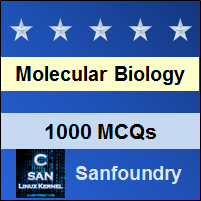 To practice all areas of Molecular Biology for online tests, here is complete set of 1000+ Multiple Choice Questions and Answers.